The goal of the present protocol was to develop a method that will allow functional genomic analyses of mast cell secretion. The protocol is based on quantitative assessment of the release of a fluorescent reporter gene cotrasfected with the gene of interest and real time analyses of the secretory granule's morphology. Azouz, N. P., Fukuda, M., Rothenberg, M. E., Sagi-Eisenberg, R. Investigating Mast Cell Secretory Granules; from Biosynthesis to Exocytosis. J. Vis. Exp. (95), e52505, doi:10.3791/52505 (2015). Mast Cells (MC) are secretory cells of the immune system that accomplish their physiological and pathological functions by releasing pre-formed and newly synthesized allergic, inflammatory and immunoregulatory mediators. MCs’ mediators affect multiple tissues and organs culminating in allergic and immune responses. The synthesis, storage and release of the MC mediators are highly regulated. The pre-formed mediators are packed in cytoplasmic secretory granules (SG) that fuse with the plasma membrane and release their content by regulated exocytosis. We present a protocol, based on the co-expression of a gene of interest with a reporter gene that is targeted to the SGs and is released in a regulated fashion alongside the endogenous SG mediators. The protocol enables high resolution four dimensional confocal analyses of the MC SGs and monitoring their timeline from biogenesis to triggered exocytosis. Thus, using this protocol for screening genes of interest for their phenotypic and functional impact allows deciphering the molecular mechanisms that govern the biogenesis and exocytosis of the MC SGs and identifying the regulators involved. Thereby, further insights into the cellular mechanisms that account for MCs function in health and disease should be provided. Mast Cells (MC) are immune cells that are best known for their involvement in allergic and inflammatory reactions such as arthritis, asthma, eosinophilic esophagitis, chronic dermatitis and anaphylactic shock 1,2 as well as other pathologies including coronary artery disease 3,5 and cancer 3,4. In addition, MCs play important roles in innate and adaptive immunity, both in host defense against bacteria and parasites and by suppression of immune responses, for example inducing allograft tolerance 5,6 . MCs originate from the bone marrow, developing from CD34+/CD117+ pluripotent progenitor cells 7. Committed bone marrow MC progenitors are released into the bloodstream and migrate into the peripheral tissues localizing predominantly within connective tissues and epithelial surfaces 8. Maturation and terminal differentiation are eventually achieved under the influence of cytokines within the surrounding milieu 8,9 . MCs can be activated by an allergen (antigen, Ag), whose encounter resulted in the generation of immunoglobulin E (IgE) type antibodies. Binding of such IgE to the MC’s FcεRI receptors, followed by cross-linking of cell bound IgE upon re-exposure to the same Ag, results in FcεRI aggregation and initiation of a signaling cascade that culminates in cell degranulation [reviewed in 10,11]. MCs are also activated, independently of IgE, by neuropeptides 5,12, toxins 13 , bacterial and viral antigens 14,15, a number of positively charged peptides collectively referred to as basic secretagogues, immune cells and cytokines 5,13,12,16,17. MCs are also activated by many of their own released mediators, which further amplify the inflammatory response. MCs are packed with secretory granules (SGs) that contain immunoregulatory mediators, including vasoactive amines, such as histamine and serotonin (in rodents), proteoglycans, proteases, such as chymase and tryptase, vascular endothelial growth factor and several cytokines and chemokines 8,9. These mediators are “ready to go” and once MCs are activated by an appropriate stimulus, these mediators are released from the cells by regulated exocytosis (degranulation) in a matter of seconds to minutes 18,19. This initial event is followed by the de novo synthesis and release of a large array of biologically potent substances, including arachidonic acid metabolites, multiple cytokines and chemokines 20,21,22. Release of newly synthesized products occurs independently of SG release. Collectively, these mediators initiate early and late phase inflammatory and allergic responses. Therefore, understanding the mechanisms accounting for MC activation and degranulation are both of theoretical and clinical importance. The difficulty to genetically manipulate primary and cultured MCs has hampered the attempts to elucidate the mechanisms underlying MC degranulation, which remained poorly resolved. To overcome this problem we developed a reporter based assay by co-transfecting the mucosal mast cell line, rat basophilic leukemia (RBL)-2H3 (herein referred to as RBL) or bone marrow derived MCs (BMMCs) 30 with a gene of interest and Neuropeptide Y (NPY) fused to monomeric RFP (mRFP), as a SG reporter. NPY was previously shown to recapitulate the behavior of endogenous SG markers in other systems. Moreover, because mRFP fluorescence is pH insensitive, expression of NPY-mRFP allows visualization of the acidic SGs as well as quantitative assessment of exocytosis by using 96-well plates and a fluorescence plate reader. We have shown that NPY-mRFP is delivered to the acidic SGs of RBL cells and BMMCs and is released from the cells in a regulated fashion alongside the endogenous SG cargo (i.e., β-hexosaminidase and serotonin) 30,32 . This protocol provides a high-resolution imaging-based methodology that allows screening genes of interest for their phenotypic and functional impact on SG characteristics and degranulation in RBL cells 32. Specifically, this protocol allows real time tracking of MC SGs and quantification of their area or volume size, their number, kinetics of assembly, their movement along the cell cytoskeleton and their ultimate fusion with the plasma membrane under different conditions. For example, sensitizing the cells with DNP-specific IgE and triggering the cells with a multivalent Ag (DNP conjugated serum albumin) under different perturbations (i.e., knockdown of genes of interest, over expression of wt or mutant genes, or pharmacological manipulations) and comparing to control cells. Mix 500 ml of low glucose Dulbecco's modified Eagle's medium (DMEM) with 56 ml of fetal bovine serum (this makes 10% FBS), and then add 5.5 ml of penicillin streptomycin (this makes ~1% PEST). Filter the media by using 500-1,000 ml Bottle-Top Vacuum Filters with 0.22 μm pore size and store at 4 °C. Grow RBL cells in a humidified atmosphere of 5% CO2 at 37 °C in either plates or flasks. RBL cells that are growing in 10 cm plates should be supplemented with 10 ml medium and form confluent monolayer of ~107 cells/plate. When the cell layer is approaching confluence, replate the culture at a lower density. Remove the culture medium from the plate/flask using a sterile pasteur pipette connected to vacuum. Rinse the cell monolayer with prewarmed (37 °C) 0.25% trypsin/EDTA that covers the whole monolayer (the volume depends on the size of culture plate/flask; 2 ml for 10 cm plate). This will detach the cells. Alternatively, rinse the cell monolayer with Phosphate buffered saline (PBS), remove the PBS and add prewarmed (37 °C) trypsin/EDTA. This step detaches the cells faster. Place the plate/flask in an incubator at 37 °C (no more than 10 min). Inspect the cells under the optical microscope to check if they have detached. If the cells did not detach after 10 min, gently tap on the plate/flask. Add medium to the culture plate/flask to suspend the cells (the volume of the medium should be at least 2-fold larger than the volume of the trypsin solution). Pellet the cells by centrifugation for 3 min at 200 g at 25 °C. Resuspend the cells in medium. Dilute the cells by 1:10 and seed in a new culture dish. Incubate the cells for 48-72 hr, until they reach approximately 90% confluence. Repeat the same procedure (section 2.2.1-2.2.8) for up to 3 months (30 passages). 3. Preparation of Transfection Media. Prepare a 100 mM solution of K-Pipes pH 7, 1 mM solution of Ca2+ acetate and 100 mM solution of Mg2+ acetate. Dilute the 100 mM solution of K-Pipes pH 7 into 20 mM using DMEM media, add the 1 mM solution of Ca2+ acetate to a final concentration of 10 μM and 100 mM solution of Mg2+ acetate to a final concentration of 2 mM. Weigh Potassium glutamate and add to the solution to a final concentration of 128 mM, mix well and keep at 4 °C until use. Keep the remaining solutions (i.e., K-Pipes, Ca2+ acetate, Mg2+ acetate) at -20 °C. Rinse the cell monolayer with prewarmed (37 °C) trypsin/EDTA that should cover the whole monolayer. Place the plate/flask in an incubator at 37 °C (no more than 10 min). Check if the cells have detached using the optical microscope. Add medium to the culture plate/flask to suspend the cells (the volume of the media should be at least 2-larger more than the volume of the trypsin solution). Count the cell number using hemocytometer. Pellet 1.5 × 107 cells by centrifugation for 3 min at 200 x g at 25 °C. Discard the supernatants and add 280 µl of transfection medium. Transfer the reaction mix into 4 mm cuvette. Add 20 μg of NPY-mRFP plasmid and either 30 μg of control empty plasmid or a tested plasmid. The final volume of the reaction mix should be 300 μl. Immediately place on ice for 10 min. Wipe the cuvette from residual water and proceed to electroporation at 300 V for 9 msec. For measurements of exocytosis, replate the cells immediately in 24 well tissue culture dishes containing 300 μl medium. Add 8 μl of the reaction mix (4 × 105 cells) to each well. Add 4 × 105 non transfected cells to additional wells for control. Prepare enough wells for to have at least duplicate wells for each treatment for every transfection. For time lapse microscopy, replate the cells immediately in an 8-well chamber borosilicate coverglass system containing 80 μl medium. Add 1.5 μl of the reaction mix (7.5 × 104 cells) to each chamber. (Try to avoid using the chambers at the edge of the coverglass, the chambers at the center of the coverglass are easier to image). NOTE: Importantly, not all the cells response to a trigger and occasionally the time-lapse microscopy is abrogated due to loss of focus and drift of the 8-well chamber borosilicate coverglass system. Therefore, prepare at least 8 chambers for each treatment for each transfection. For sensitizing the cells for FcεRI mediated activation, add 1 µg/ml of mouse DNP specific monoclonal IgE to the media (incubate the cells with IgE for at least 2 hr). After 18-24 hr use a fluorescent microscope to confirm that the cells express the plasmids. The excitation and emission wavelengths of mRFP fluorescence are: λEx 584, λEm 607 nm. NPY-mRFP should appear in vesicular structures which correspond to the SGs. If the second gene of interest is fused to a fluorescent tag use a fluorescent microscope to confirm the co-expression of both plasmids at the same cells. For example, if the tested gene is fused to GFP, The excitation and emission wavelengths of GFP fluorescence are: λEx 488, λEm 507 nm. The GFP tagged protein should appear at the same cells that express NPY-mRFP. For exocytosis measurements proceed to step 5 and for time lapse microscopy, proceed to step 6. Prepare a solution of 54 mM KCl, 20 mM MgCl2, 2.74 M NaCl and 8 mM NaH2PO4 in DDW. Mix well and store at 4 °C. This step is for preparation of 20x Tyrode buffer. Prepare a solution of 20 mM Hepes pH 7, 1.8 mM CaCl2, 1 mg/ml BSA, 5.6 mM glucose and 1 to 20 dilution of Tyrode 20x in DDW and mix well. This step is for preparation of 1x Tyrode buffer. Aliquot the 1x Tyrode buffer and store at -20 °C. Avoid repeated freezing and thawing. Remove the culture medium from the 24 well plate and wash 3 times with Tyrode buffer. Prepare unstimulated cells by adding 200 μl Tyrode buffer to control wells. Prepare 10 μl/well of 20X concentrated activating reagent [(e.g. 1,000 ng/ml DNP-BSA or DNP-HSA (Ag), 200 µM Ca2+ionophore (e.g. A23187), and a combination of 20 µM Ca2+ ionophore and 1,000 nM 12-O- tetradecanoylphorbol-13-acetate (TPA)]. If the reagents are stored in DMSO, dilute the reagents into 20x concentration in Tyrode buffer containing 1% DMSO. Incubate at 37 °C for 30 min. Remove the supernatants of each well carefully to a 96 well plate, place on ice and avoid from light. (The supernatants contain the chimeric peptide NPY-mRFP that was released from the cells). Add 200 μl Tyrode buffer containing 0.5% Triton X-100 to each well and incubate at 37 °C for 10 min. (This step is important for preparation of cell lysates that contain the remaining of NPY-mRFP that was not released from the cells). Collect the cell lysates and transfer to a 96 well plate, place on ice and avoid from light. Measure the fluorescence of the cell supernatants and cell lysates using a fluorescence plate reader, using a 590-, 20 nm bandwidth excitation filter and 635-, 35 nm bandwidth emission filter. NOTE: The fluorescence reader measure arbitrary fluorescence units (AFU). AFU values depend on the machine and its sensitivity and the transfection efficiency. Set the autofluorescence of nontransfected RBL cells as blank. Divide the AFU of each supernatant to the total fluorescence (AFU of the supernatants + AFU of the corresponding lysate) and multiply by 100. Add 72 μl of Tyrode buffer to each chamber. Dilute the activating reagents in Tyrode buffer to 10x concentration. Use a confocal fluorescence microscope equipped with a heated chamber (37 °C) and CO2 controller (4.8%) and a 40X or 63X objective. Turn on the microscope systems: mercury lamp, computer, and lasers. Make sure that the heated chamber is at the right temperature before starting the experiment. Place the chamber in the heated chamber and make sure that the chamber is installed correctly and stable. Turn on the fluorescence light according to the relevant fluorophore and visualize transfected cells. Turn off fluorescence once a cell of interest is in the field in order to minimize bleaching and cytotoxicity. It is important that this field will contain about 2-3 transfected cells. The transfected cells should be well spread but not touching each other. Adjust the laser power (depending on the microscope) to minimize noise and oversaturation as well as toxicity, and set the gain and offset to modify the signal to noise ratio. Scan fast in order to minimize the duration of laser exposition (average 2). Adjust the pinhole size to a maximum, this enables decreasing the laser power and to maintain images focused for a long period of time. If desired, set the parameters for the Z stack to reconstruct the image in three dimensional, adjust the pinhole size to 1 airy unit (AU) that gives the best signal to noise ratio and acquire successive scanning of two-dimensional confocal optical slices in the z-axes with optical slices ≤0.7 μm. Set the interval time between each acquisition to 15-30 sec and the duration of total acquisition to 15 min and start acquiring images. After 5 min of acquisition pause the time series. Add 8 μl of the 10x trigger and continue the acquisition immediately. Save the pictures, perform deconvolution using a deconvolution software and reconstruct the stacks to three dimensional images and to a movie using Imaris software. Import the data from the deconvoluted time series images that were obtained by the confocal fluorescence microscope to Imaris software. This software reads more than 40 microscopy files. If the software cannot read the files; convert the files to tif files and import. To add time points to the end of an open data set press edit -> Add Time Points and import the new data set. Create surface of the mRFP channel using surface wizard option. Choose the default algorithm. Choose the channel of NPY-mRFP. Mark the smoothing option to reduce noise. To avoid loss of small details reduce the area detail level to 0.05 μm. Set the intensity threshold. New gray surface will be displayed. Go to “Settings” and switch the style from “Center point” to “Surface”. Go to the statistic tab in the properties of selected object, select the detailed tab and the specific value such as fluorescence intensity, volume etc. Review the data and confirm that the values are compatible with the images. For example, two or more adjacent granules might be measured as one bigger granule. For quantifying the average granule size divide the size of the merged granules to the actual number of granules. Export the desired data sets to Excel files and analyze the data. Because of the low transfection efficiency of MCs, genetic manipulations are unlikely to leave an impact on readouts of average secretion measured by endogenous SGs mediators. Nevertheless, by establishing complete co-expression of the reporter gene NPY-mRFP and the co-transfected plasmid at the same cells, monitoring of NPY-mRFP results in monitoring exclusively the cell population that expresses the gene of interest. 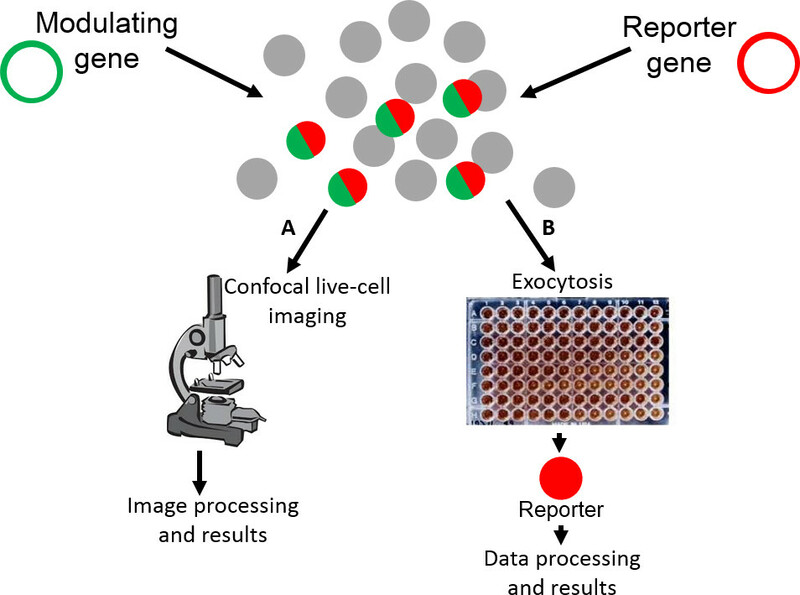 Therefore, the advantage of this assay compared to conventional methods is the ability to selectively monitor genetically manipulated cells (Figure 1). Indeed, using this assay we have screened genes that regulate vesicular trafficking including soluble NSF [N-ethylmaleimide sensitive fusion] attachment protein receptor (SNARE) proteins and 44 members of the Rab GTPases family. We identified genes that regulate SGsize, number, cargo composition and exocytosis 23. We identified 30 Rabs that altered (i.e., inhibit or stimulate) exocytosis in RBL cells stimulated by either Ag or by the combination of a Ca2+ ionophore and the phorbol ester TPA (Ion/TPA) 23. Confocal imaging revealed SNAREs and Rabs that caused dramatic phenotypes altering the morphology of the cells or the SGs 30,32. Confocal imaging of these proteins revealed 8 SNAREs and Rabs that caused dramatic phenotypes on the cells or the SG morphology 30,32. Using this protocol we were able to track individual SGs and perform measurements of their size, fluorescence intensity, their movement and exocytosis. For example, we identified Rab5 as a regulator of SG biogenesis 30. Rab5 has been identified as a master regulator of endocytosis and endosomal fusion 24. We have shown that co-expression of constitutively negative (CN) GDP-locked mutants of the endogenously expressed isoforms of Rab5 (Rab5A, Rab5B and Rab5C), or expression of Rab5A/B/C targeting shRNAs, reduced significantly the SGs’ size with a concomitant increase in their numbers 30. Conversely, expression of a GTP-locked, constitutively-active (CA) Rab5A mutant (Rab5A Q79L, herein: “CA Rab5A”), which is known to facilitate homotypic fusion of early endosomes (EEs) 24, resulted in the formation of giant Rab5A-decorated vesicles, which we identified as SGs based on their content of the secretory cargo NPY-mRFP and serotonin, and their capacity to exocytose in a regulated fashion 30. Figure 2 demonstrates morphometric analyses of the NPY-mRFP–containing SGs. The mean SGs volume in CA Rab5A-expressing cells reached the value of 44 μm3, which was >20-fold larger than the mean volume of the SGs in the control GFP-expressing cells while their number was decreased by 20-fold (Figure 2A). The inverse relationship between the number and size of SGs (Figure 2A)suggested that the Rab5-mediated enlargement of the SGs involves their homotypic fusion. The giant NPY-mRFP containing SGs formed by CA Rab5A allows confocal microscopy imaging of living cells in a high-resolution that enables monitoring the SGs in details that could not be possible otherwise. For example, we detected Rab5A in fusing SGs alongside smaller structures scattered among the giant SGs, most likely corresponding to endosomes (Figure 2B). Additionally, we have shown that Rab5 transiently and preferably associates with newly formed SGs suggesting that the selective and transient association of Rab5A with newly formed SGs is compatible with a fusogenic apparatus in which only newly generated granules have the capacity to fuse with other SGs 30. Figure 3 shows representative time-lapse images of MC giant SGs that were formed by expression of CA Rab5A and the kinetics of exocytosis in the resolution of a single SG after stimulation. During MC exocytosis, the SGs move towards and fuse with the plasma membrane. As a consequence the secretory cargo is released from the cells into the extracellular space. In this experimental system, NPY-mRFP is released from the cells and found in the cells supernatants. The fluorescence of NPY-mRFP in the cell supernatants can be measured by a fluorescence reader. However, because NPY-mRFP is diluted in the supernatants its fluorescence signal cannot be detected or visualized by fluorescence microscopy. The release of NPY-mRFP from the granules during exocytosis results in a rapid and dramatic decrease in NPY-mRFP fluorescence intensity and shrinkage of the NPY-mRFP-containing SGs and their disappearance.Therefore, live cell imaging of stimulated cells and measurements of NPY-mRFP fluorescence intensity or NPY-mRFP containing SG size provide accurate assessments of the kinetics of exocytosis of individual granules. Figure 3B shows the fluorescence intensities of SGs after stimulating the cells with a Ca2+Ionophore. The SGs undergo exocytosis at different time points (i.e., 2, 3, 6, and 11 min post stimulation), while the fluorescence intensity of a single SG that did not fuse with the plasma membrane remained constant. Figure 1: Illustration of the main steps of the protocol. RBL cells are cotransfected with NPY-mRFP and a second gene of interest or corresponding control plasmid and immediately seeded on coverslips, 8-well chamber borosilicate coverglass system or 96-well plates. Next day, Images of the NPY-mRFP-containing SGs in resting and triggered cells are acquired by confocal microscopy (A). In addition, exocytosis of resting and triggered cellsis quantified by measuring the release of NPY-mRFP in a 96 well plate fluorescence reader (B). Figure 2: Quantification of the SGs’ size. RBL cells were cotransfected with NPY-mRFP and either GFP or GFP-CA Rab5A and seeded on 8-well chamber borosilicate coverglass system. 24 hr later, the 8-well chamber was placed in laser confocal microscope equipped heated chamber (37 °C). Z-stack images of successive images with optical slices 0.7 μm were captured using a 63X oil/1.4 numerical aperture objective. The images were deconvoluted and three dimension images were constructed by the Imaris software. The volume of the SGs and their number were calculated using the Imaris software (A). Part of the NPY-mRFP–containing granules appears to be embedded within Rab5A (arrowheads). Others are naked or bridged with Rab5A (arrows). Scale bar = 5 µm (B). Please click here to view a larger version of this figure. Figure 3: Measuring the extent and kinetics of exocytosis in the resolution of a single SG in activatedRBL cells. RBL cells were cotransfected with NPY-mRFP and GFP-CA Rab5A and seeded in8-well chamber borosilicate coverglass system. 24 hr later in8-well chamber was placed in a laser confocal microscope equipped with a heated chamber (37 °C) and the cells were triggered with 10 μM Ca2+ Ionophore. Images were acquired every 15 sec using a 63X oil/1.4 numerical aperture objective. Images were deconvoluted and then processed by the Imaris software. Scale bar = 5 µm (A). The mean fluorescence intensity of the NPY-mRFP containing granules was determined by the Imaris software and the data were normalized according to time 0 (time of addition of the Ca2+ Ionophore). The arrows represent the time points at which release of SGcargo wasnoted (B). Please click here to view a larger version of this figure. We describe an innovative strategy that combines quantification of MCs exocytosis and four (x, y, z, t) dimension quantifications by time-lapsed three-dimensional imaging of the SGs in living cells using a reporter gene for exocytosis. This technique enables screening of families of proteins for their impact on MC function such as monitoring SGs starting as early as their exit from the Golgi through their maturation, acquisition of exocytosis competence and degranulation. The combination of measurements of exocytosis together with morphometric and kinetic characterizations of the SGs provides insights into the mechanisms by which the tested proteins mediate MC functions. Therefore, using this methodology, genetic manipulation of targeted genes can unveil new molecular mechanisms by which the MC SGs store and release their cargo. Notably, NPY can serve as a reporter for exocytosis in other secretory cells such as MCF-7 cells, a cell line derived from a human mammary gland adenocarcinoma 31, chromaffin cells 34 and pancreatic β-cells 35. Genetic manipulations are the most powerful tools currently available for researching functional networks. Genetic manipulations allow the identification of essential proteins in each network, whose deletion will enforce collapse of the system, as opposed to other proteins, whose deletion will enforce crosstalk between parallel networks or have no effect due to redundancy. However, because of the low transfection efficiency of MCs, when measuring exocytosis of endogenous mediators only a small fraction of cells is expressing the 'manipulating' test DNA. Hence, when measuring exocytosis of endogenous mediators, the contribution of the transfected cells to the total readout is minor. Therefore, attempting to adopt such approach to explore the complex networks associated with regulated exocytosis in MCs was hampered. This technique overcomes the obstacle of the low transfection efficiency and provides a simple way to observe phenotypic alternations of MC SGs caused by over expression, knockdown and mutagenesis of genes of interest. This technique can be extended for investigating the hierarchy and mode of interaction of functional networks using transient triple-transfection. The results will be analyzed to determine which gene can rescue a certain phenotype; cause a more dramatic phenotype or have no effect. Based on such combinatorial transfections, exocytosis networks can be constructed. For example, using triple-transfection we were able to identify the SNARE protein VAMP8 as a downstream mediator in the process of Rab5-dependent SG fusion 25. This method permits visualization and quantification of exocytosis in the resolution of single SGs. Indeed we were able to show that SGs display differential responses to stimuli. The reason as to why certain SGs fused with the plasma membrane while others did not or the reason for the differential kinetics of MC SG fusion remain to be determined. Future studies using this experimental approach have the potential to answer these questions. For example, quantification of different SNAREs or Rabs on individual SGs and correlation with exocytosis competence and the kinetics of exocytosis in the resolution of a single SG should reveal novel regulators of exocytosis. The main limitation of this technique is the genetic manipulation because overexpression of a protein might affect cell function or morphology. Therefore, it is essential to validate the results with complementary approaches. For example, when overexpression of a constitutively active mutant inhibits exocytosis, the effect of a constitutive negative mutant or knock down of the gene should be tested as well. Using this technique, we identified novel regulators of MC functions, which affect MC exocytosis or alter the SG morphology. The combination of exocytosis measurements together with SGs morphometric characterization provides deeper insights into the function and mechanisms of action of the tested proteins. We thank Dr. U. Ashery for the gift of NPY-mRFP cDNA. We thank Drs. M. J. Kofron, L. Mittleman, M. Shaharbani, and Y. Zilberstein for invaluable assistance with microscopy and image analyses. We also thank Dr. Joseph Orly for critical reading of this manuscript. This work was supported by a grant from the Israel Science Foundation, founded by the Israel Academy for Sciences (1139/12 to R.S-E.). Abonia, J. P., et al. Involvement of mast cells in eosinophilic esophagitis. J Allergy Clin Immunol. 126, (1), 140-149 (2010). Galli, S. J., Tsai, M. Mast cells in allergy and infection: versatile effector and regulatory cells in innate and adaptive immunity. Eur J Immunol. 40, (7), 1843-1851 (2010). Ribatti, D., Crivellato, E. The controversial role of mast cells in tumor growth. International Review of Cell and Molecular Biology. 275, 89-131 (2009). Ribatti, D., Crivellato, E. Mast cells, angiogenesis and cancer. Adv Exp Med Biol. 716, 270-288 (2011). Tsai, M., Grimbaldeston, M., Galli, S. J. Mast cells and immunoregulation/immunomodulation. Adv Exp Med Biol. 716, 186-211 (2011). Vries, V. C., Noelle, R. J. Mast cell mediators in tolerance. Curr Opin Immunol. 22, (5), 643-648 (2010). Kirshenbaum, A. S., et al. Demonstration that human mast cells arise from a progenitor cell population that is CD34(+), c-kit(+), and expresses aminopeptidase N (CD13). Blood. 94, (7), 2333-2342 (1999). Metcalfe, D. D., Baram, D., Mekori, Y. A. Mast cells. Physiol Rev. 77, (4), 1033-1079 (1997). Gilfillan, A. M., Austin, S. J., Metcalfe, D. D. Mast cell biology: introduction and overview. Adv Exp Med Biol. 716, 2-12 (2011). Rivera, J., Gilfillan, A. M. Molecular regulation of mast cell activation. J Allergy Clin Immunol. 117, (6), 1214-1225 (2006). Rivera, J., Gilfillan, A. M. Molecular regulation of mast cell activation. Journal of Allergy and Clinical Immunology. 117, (6), 1214 (2006). Lagunoff, D., Martin, T. W., Read, G. Agents that release histamine from mast cells. Annu Rev Pharmacol Toxicol. 23, 331-351 (1983). Depinay, N., Hacini, F., Beghdadi, W., Peronet, R., Mecheri, S. Mast cell-dependent down-regulation of antigen-specific immune responses by mosquito bites. J Immunol. 176, (7), 4141-4146 (2006). Abel, J., et al. Staphylococcus aureus evades the extracellular antimicrobial activity of mast cells by promoting its own uptake. J Innate Immun. 3, (5), 495-507 (2011). Avila, M., Gonzalez-Espinosa, C. Signaling through Toll-like receptor 4 and mast cell-dependent innate immunity responses. IUBMB Life. 63, (10), 873-880 (2011). Novak, N., Bieber, T., Peng, W. M. The immunoglobulin E-Toll-like receptor network. Int Arch Allergy Immunol. 151, (1), 1-7 (2010). Rudich, N., Ravid, K., Sagi-Eisenberg, R. Mast cell adenosine receptors function: a focus on the a3 adenosine receptor and inflammation. Front Immunol. 3, 134 (2012). Theoharides, T. C., Kempuraj, D., Tagen, M., Conti, P., Kalogeromitros, D. Differential release of mast cell mediators and the pathogenesis of inflammation. Immunol Rev. 217, 65-78 (2007). Caughey, G. H. Mast cell proteases as protective and inflammatory mediators. Adv Exp Med Biol. 716, 212-234 (2011). Lundequist, A., Pejler, G. Biological implications of preformed mast cell mediators. Cell Mol Life Sci. 68, (6), 965-975 (2011). Metz, M., Maurer, M. Mast cells--key effector cells in immune responses. Trends Immunol. 28, (5), 234-241 (2007). Gordon, J. R., Burd, P. R., Galli, S. J. Mast cells as a source of multifunctional cytokines. Immunol Today. 11, (12), 458-464 (1990). Azouz, N. P., Matsui, T., Fukuda, M., Sagi-Eisenberg, R. Decoding the regulation of mast cell exocytosis by networks of Rab GTPases. J Immunol. 189, (5), 2169-2180 (2012). Stenmark, H., et al. Inhibition of rab5 GTPase activity stimulates membrane fusion in endocytosis. EMBO J. 13, (6), 1287-1296 (1994). Azouz, N. P., et al. 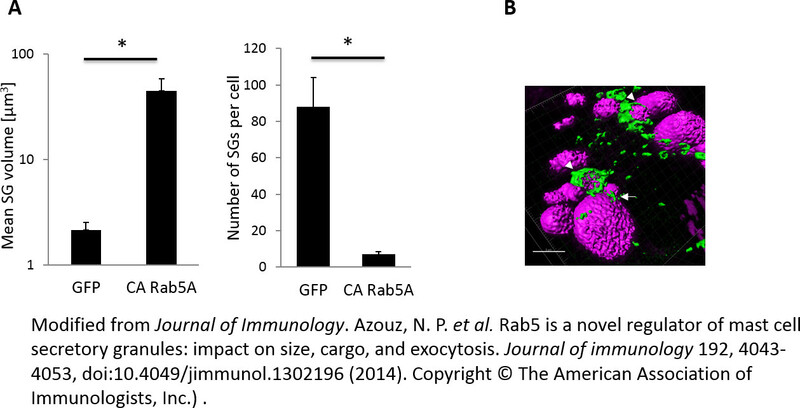 Rab5 is a novel regulator of mast cell secretory granules: impact on size, cargo, and exocytosis. J Immunol. 192, (9), 4043-4053 (2014).